This is one of my favorite quotes of all time. Not only does it describe what The Eye of the World by Robert Jordan is all about, it describes all epic fantasy. It describes anyone who ever sets out into the world beyond their home on a new adventure. When I was 18, I left home on my own journey. It wasn’t until many years later that I returned to where I grew up. I was a smalltown boy who’d barely stepped foot outside the community where I’d spent most of my life. In many ways, Jordan is right. The place I grew up doesn’t feel big enough to hold me. I have a longing for more. 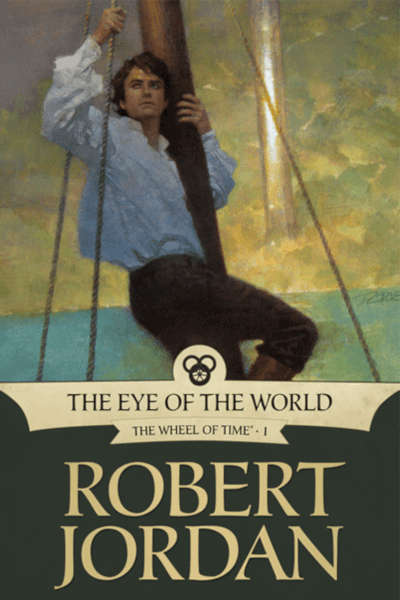 The Eye of the World is the first entry into Robert Jordan’s magnum opus: The Wheel of Time. It’s classic fantasy. A group of people from a small village set out into the great unknown. They cross vast amounts of land. It all ends in one epic battle. There’s nothing particularly groundbreaking. I’ve seen many fantasy lovers say it’s a cheap ripoff of Tolkien. But, there’s something purely enjoyable about The Eye of the World that takes ahold of the human spirit of adventure in all of us and doesn’t let go. At over 700 pages, the book never dragged on too much for me, which can tend to happen with epic fantasies (see Eragon review). The plot continued to keep me wanting to find out the next step in the journey. And, I genuinely cared about most of the characters as I watched them change. Over the past two weeks, there wasn’t a night that I didn’t look forward to sitting down with the book for an hour or two and joining Rand al’Thor and his friends on their adventure. The land itself was quiet, as if the world were pausing to catch its breath. Jordan shows his command of the language in bits and pieces without beating you over the head with it. In a year of using my Amazon Kindle, I hadn’t used its highlighting feature. His prose gave me the push I needed to figure out how it worked. There was enough quotable material that I needed to stop and reread some passages to enjoy their beauty for a second time. On the whole, I loved most of the cast. But, I grew tired of Mat’s character and the dagger storyline. I’m hoping I like him more in future books. At times, I wished Rand, our primary character, would “man up” a bit earlier in the book. I also wished that he’d treat Egwene more like the strong woman that she’s obviously becoming. What Jordan does as good as anybody is create a vivid and believable world. It has a rich history and good magic system that works within that world. He doesn’t do too much info dumping. You learn about his world as the characters learn, setting out from their small village and adventuring to places that they had only dreamed about. The Wheel of Time is a 14-book series, which is about as epic as it gets. I’m just one book in, but I’m certain that I’ll continue on to The Great Hunt, the second book in the series.